I think I need a personal Sherpa. I once read that Sir Edmund Hillary said he could have never reached the peak of Mount Everest without the steadfast help and guidance of his Sherpa. These Nepalese mountaineering cheerleaders are just the sort of thing I need to get square with the world. Can I order one online like a mail-order bride? To the left you can see how much fun we would have together. Me, pointing onward and upward, challenging him to stay with me as we climbed. 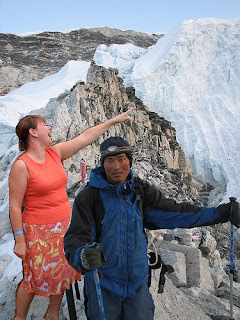 Him worrying that one day this picture would be used by an unscrupulous blogger to make it appear that she actually climbed a mountain. Such silly paranoia. But what is paranoia when you know that given the choice between sitting on the floor eating chips or taking the stairs can be so easily answered? It's not paranoia to know you are going to think of a REALLY good reason why you can't make it to the gym, do the laundry, feed the cats or put toilet paper on the roll. Where is my focus? I seem to be weaving madly all over the road. Rear view mirrors and garden gnomes dive for safety at my approach. I need guidance. Direction. Herding. One of those pointy poles in the back should just about do it. Posted by Heidi Schempp Fournier at 6:31 p.m.
That picture is AWSOME!!! Funny girl!